While growing up, this was my favorite "melt in your mouth" confection. My mother didn't make it often, just on special occasions. 1. Cook sugar and milk in a sauce pot over medium heat to just under the soft-ball stage, to 230℉. 2. 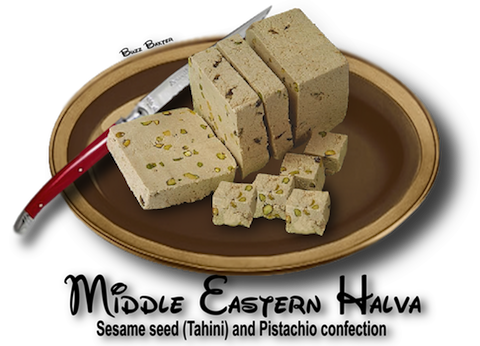 Remove from fire and add tahini, vanilla and pistachios,  but do not mix in immediately. Let it cool about 2 minutes. 3. Beat with paddle or wooden spoon for a few seconds and pour quickly into a buttered pan. 5. Goes well with strong,  black Turkish coffee. 1. Keep refrigerated when not being served,  as it will turn soft. Taste and texture is best when firm and cool.